IN BRIEF: Andy talked talk about the landscape of data visualisation, particularly examining the fine line between form and function, assessing the different styles and functions of designs that exist to fulfil varying purposes. OUR SPEAKER: Andy Kirk is a UK-based freelance data visualisation architect, consultant, training provider, author and editor of the website visualisingdata.com. His book Data Visualization: a successful design process was recently published. IN BRIEF: Lucienne talked about a variety of her recent projects including the Wellcome Collection exhibition Brains: The Mind as Matter, which is transferring to Manchesters Museum of Science and Industry this summer, and Looking Good: Decoding the Nuns Habit due for publication by GraphicDesign& later this year. 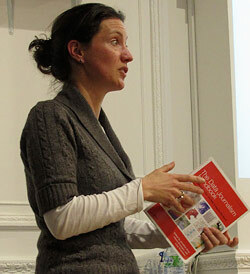 OUR SPEAKER: Alongside studio-based work, Lucienne writes, lectures and publishes. Her books includeÂ The Designer and the Grid [Rotovision, 2002] andÂ Good: An Introduction to Ethics in Graphic Design [AVA Academia, 2006]. She teaches and lectures internationally and is external examiner of BA Typography and Graphic Communication at Reading University. Her latest book, Design Diaries: Creative Process in Graphic Design [Laurence King, 2010] was co-written with design educator and writer Rebecca Wright. IN BRIEF: Mike spoke about his experience working across disciplines to develop unique design, information and wayfinding solutions to improve user experience of cities, places and spaces. We have a recording of Mikes talk, which will soon be processed so you can download it from this site. IN BRIEF: Designing a timeline of events seems like a pretty trivial exercise in visualisation. Stephen highlighted some of the difficult and subtle decisions actually involved. What shape is time and how should it be drawn? The talk emphasises innovations during the eighteenth century, when these questions were raised for the first time. 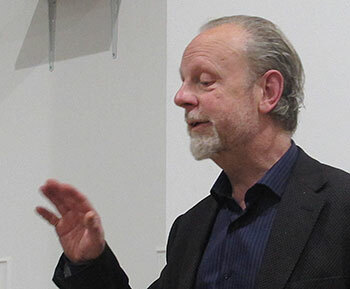 OUR SPEAKER: Dr Stephen Boyd Davis leads staff research activities in the School of Design at the Royal College of Art. His personal research is concerned with visual representation of historical time, especially in interactive digital media. We have an audio recording (with Stephens permission) of this talk, at one hour and twenty minutes, together with his slide-set (182 slides), converted to PDF. The slides include some fascinating examples of early timeline design, with detail you will want to pore over... To make it easy for you to listen to the audio recording and follow the slides at the same time, we have added to the left of the stereo audio mix a voice prompt (slide seven...slide eight etc) to help you keep in sync. IN BRIEF: Our speakers looked at the design evolution of the BBCs full form general election results graphics and associated screen architecture since 2005  and the 2010 data table for predicting likely coalitions. They also presented about the newer development, developments since 2010, using Virtual Reality and Augmented Reality approaches. OUR SPEAKERS: Jonathan Spencer is the Creative Director for Virtual Reality Strategy in BBC News: he has seven BDA awards for television work and two for interactive design work to his credit. Mark Edwards is the lead designer for BBC broadcast election specials. IN BRIEF: The internet has had a profound impact on journalism, as it has on many things. The vast quantity of data the internet has enabled us to discover, collect, explore and share is part of this. Visual design provides a powerful tool for finding and telling the stories contained within data. Data journalism spans several disciplines: designers have much to contribute, and much to learn. OUR SPEAKER: Lulu Pinney describes herself on her LinkedIn page as an Infografista  a person who explores, harnesses and then visually communicates information in a useful and digestible manner. She was educated to become a numbers person, but she became equally curious about pictures and words. Lulu gained design experience at Pentagram, Haymarket Business Publishing and BBC News Online. She now teaches about and creates infographics, and writes about it on her blog Telling Information. Note: Lulu Pinney is also associated with The Data Journalism Handbook: a free, open source reference book for anyone interested in the emerging field of data journalism. Its a collaborative effort involving dozens of data journalisms leading advocates and best practitioners  including from the Australian Broadcasting Corporation, the BBC, the Chicago Tribune, Deutsche Welle, the Guardian, the Financial Times, Helsingin Sanomat, La Nacion, the New York Times, ProPublica, the Washington Post, the Texas Tribune, Verdens Gang, Wales Online, Zeit Online and many others. The Data Journalism Handbook is published by OReilly, but is also freely available as a Web edition online. Since the IDA started in 1991, our programme has included evening meetings in London: a mix of a lecture or discussion with a social event. We aim to run six of these in London each year, plus a number of networking events at pubs. Meetings are free to IDA members! We are building a section of this site which lists previous events, and in some cases provides links to recordings and/or written accounts of them. Our big event of 2012 was IDC 2012, the latest in the series of international, UK-based Information Design Conference events. Attendance was at capacity, with over a hundred people on each of the two days, about three dozen speakers, and a room full of poster presentations too. Information Design Conferences are held every other year, in the Spring. In the autumn of 2013 we expect to publish our call for submissions for IDC2014.